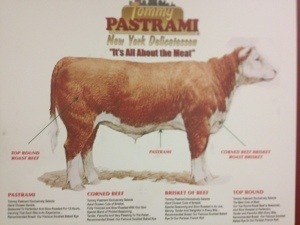 I always find it strange how delis use titles such as “New York style” to describe their food, when the people who own the restaurant or make the food have never stepped foot in New York. Los Angeles can be a very gullible city, simple because most people want to try things that are different just for the sake of being different and they have no frame of reference to really know if what they are trying actually taste in alignment with the style that is being referenced. 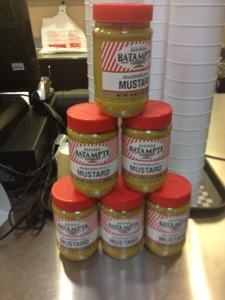 How does one really compare a product to something you have never had…I guess this question is one for the ages. 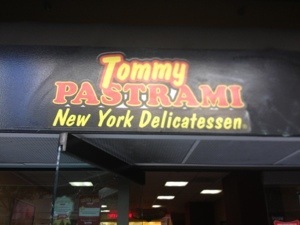 Well I am not one of those gullible people I have experienced New York pastrami and corned beef and I am keenly aware of how it should taste and “Tommy Pastrami a New York Delicatessen” is faking everyone out. The server in this so called delicatessen was absolutely fabulous, her demeanor was reminiscent of a nurse with spectacular bedside manner, except she had counter side manner which completely bowled me over and it was she who convinced me that corned beef was the way to go. 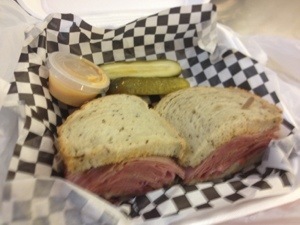 Now the corned beef special I ordered was not on the menu, but after a little additions and subtractions to the NY Reuben I was able to get a corned beef special on slightly warmed rye bread, russian dressing (house made) , and coleslaw. 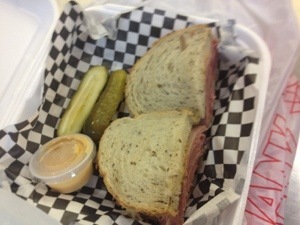 I must write after a long day I was excited to get this sandwich home, I mean I even skipped lunch with the anticipation of eating a mile high sandwich with corned beef so supple my eyes would close slowly from blissful euphoria. But to my dismay it fell completely flat, the corned beef was sliced to thick, everyone who has eaten a NY corned beef special knows the meat should be sliced thin, it should be succulent and so tender that as soon as it hits your tongue it begins to melt, unfortunately there was no melting here and the amount of time it took me to chew the corned beef made me wonder if I was eating meat or flavorless gum. The coleslaw was mediocre, coleslaw should be creamy like it is New York, it should be good enough to eat alone without a sandwich. I should have know something was fishy when the server asked me if I wanted extra russian dressing on the side..WHERE THEY DO THAT AT?? ?I will tell you that in NY they don’t, they just wrap that baby up in wax parchment paper throw it in a brown paper bag, no extras required, except for napkins of course. 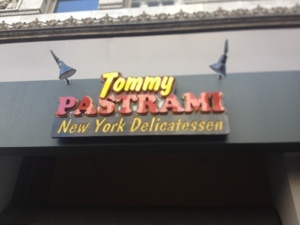 Tommy Pastrami in downtown Los Angeles you faked me out using that New York name in your signage and I fell for the okey doke, like a novice but my momma taught how not to be a fool twice, which means I wont be back. Wow I know that was disappointing. Especially when your mouth all ready for what you thought would be a good cornbread on rye. Keep up the good job with the blog.